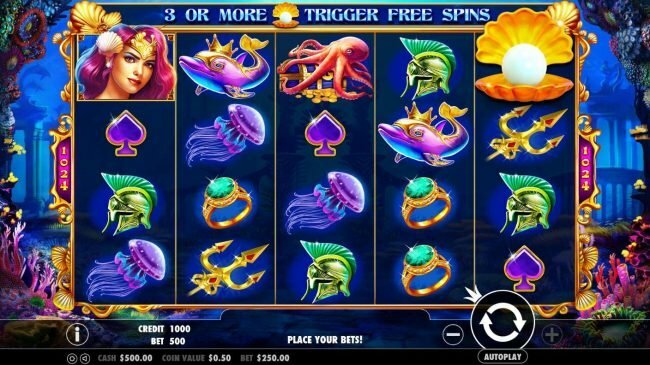 Queen of Atlantis Slots has not been reviewed yet, be the first to rate this slot. 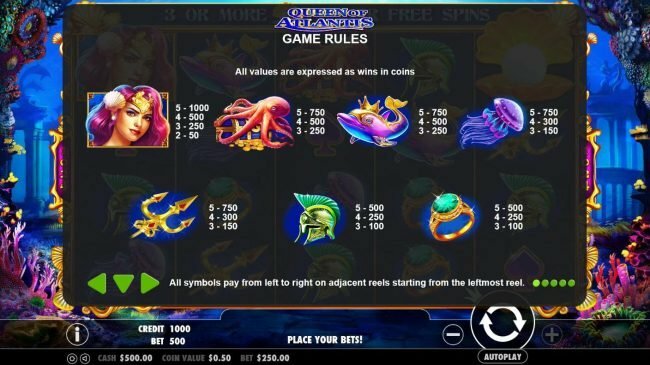 Examining this we noticed that the 1024 line, 5 game reel slot machine Queen of Atlantis is a blast to review. 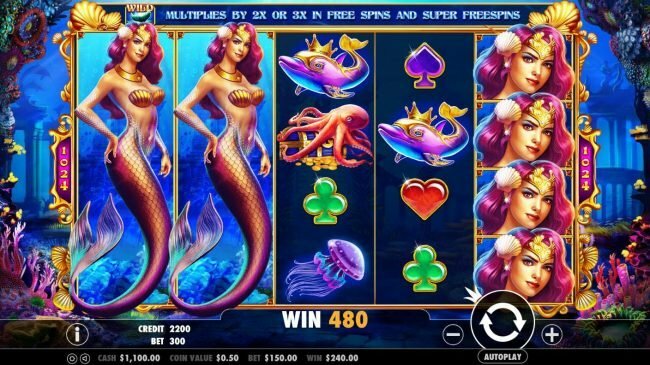 This mermaid theme based online video slot displays its work in production with mermaid, octopus, dolphin, jelly fish, gold trident, helmet and ring, and then Queen of Atlantis delivers more with clubs, diamonds, spades and hearts putting you right in there. Having wagering from $0.25 to the maximum of $250.00, this Pragmatic Play developed online video slot machine allows many levels. 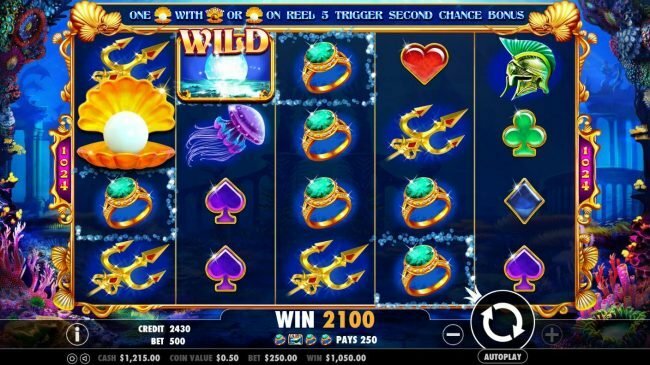 The wild whale tail wild symbols can substitutes for the values of everything except for the pearl oyster and gold super pearl oyster (5th reel only) symbol, increasing greatly your chances of a wining combination. 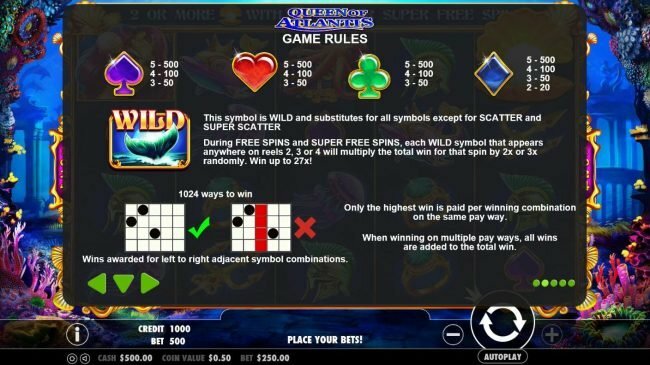 Scatter icons utilized in Queen of Atlantis are special, these pearl oyster and gold super pearl oyster (5th reel only)s are not required to appear on a single to win. 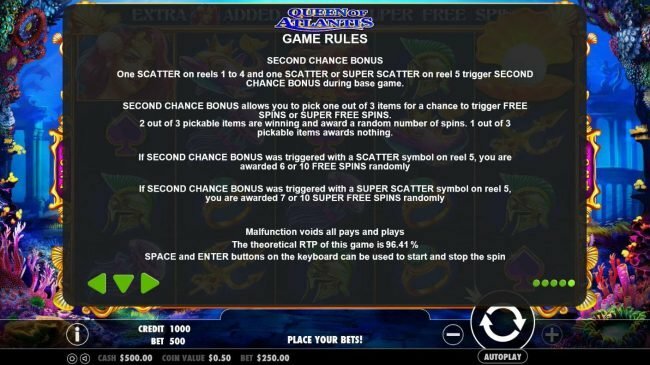 Along with many other slot machines having more than two scatter symbols will start a slot feature game. 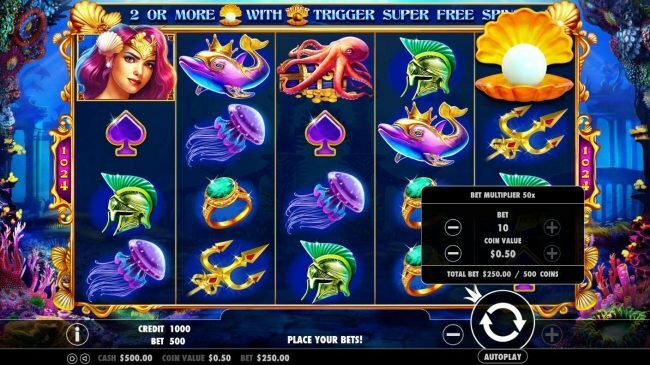 Other slot machines from Pragmatic Play software such as Queen of Gold, Sugar Rush Valentine's Day and Pixie Wings deliver similar slot machine play. 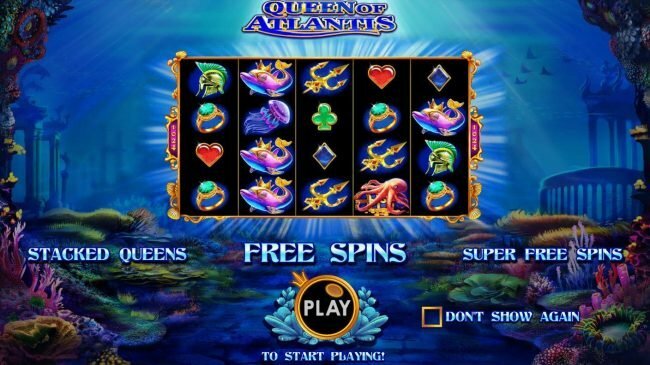 Along with other 5 reel Slots, the Queen of Atlantis slot is fun to play. The Pragmatic Play designers put in a lot of hours to make a game this good experience. Using icons including mermaid, octopus, dolphin, jelly fish, gold trident, helmet and ring can place you into the mermaid world. To wrap it up we think Queen of Atlantis is an entertaining game featuring hardy pays and supporting sounds. 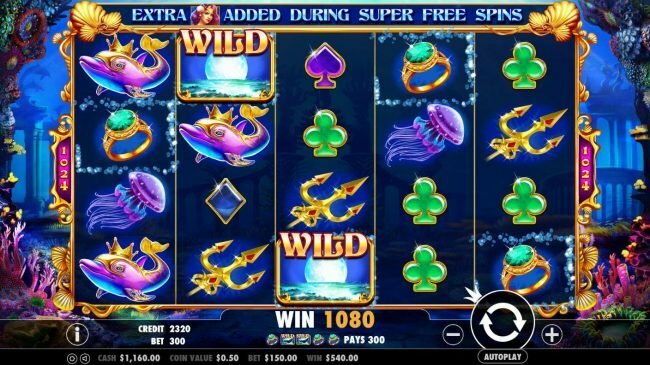 Playing Queen of Atlantis, you can really get ahead with credits, this is achieved by getting a slot Bonus game win. 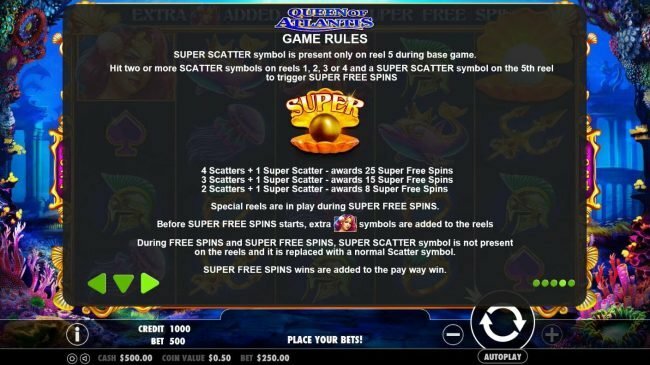 With my online video slot reviews we like to leave you on the best parts to focus on like these awesome game bonuses. Get three or more scatter symbols anywhere on the reels, awards 8, 15 or 20 free spins respectively. This will start the Free Games feature game. 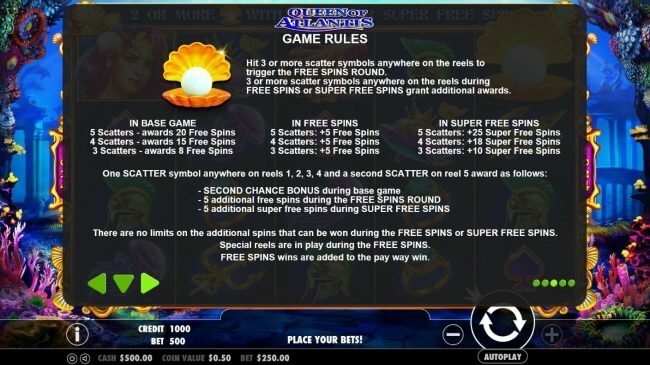 I appreciate the Queen of Atlantis Super Free Spins as well as the pay it brings. 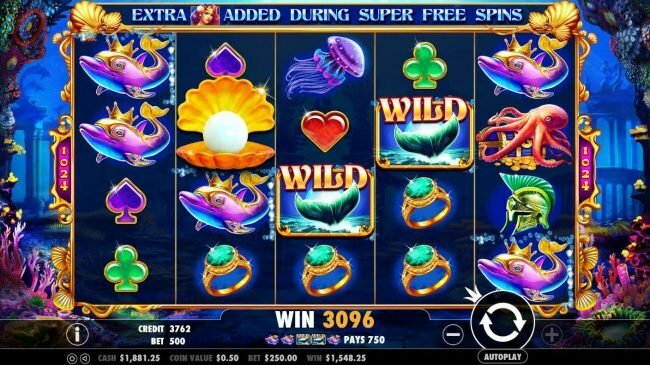 By achieving hitting two or more scatter symbols on reels 1, 2, 3 or 4 and a gold super pearl oyster scatter symbol on the 5th reel this bonus will begin. By getting landing one scatter symbol on reels 1 to 4 and one scatter or super scatter symbol on reel 5 the bonus round triggers. This Second Chance Bonus is a decent way to collect winnings. 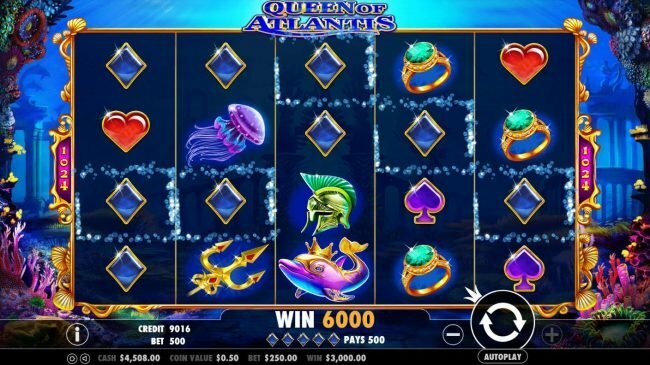 As with most bonuses, the Queen of Atlantis Bonuses allows you an opportunity to achieve the tide changing win. 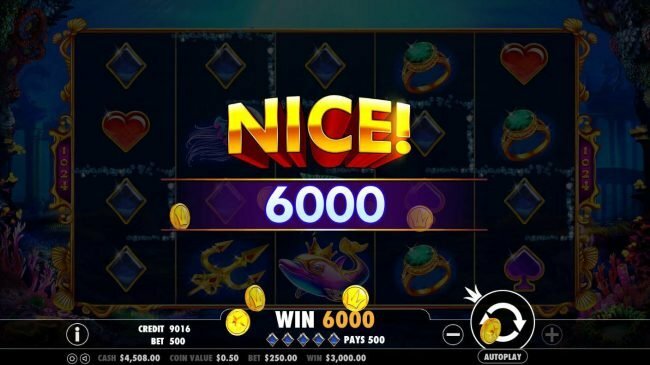 Bonus rounds add so much excitement to video Slot machines, this is obviously the best feature of Queen of Atlantis.